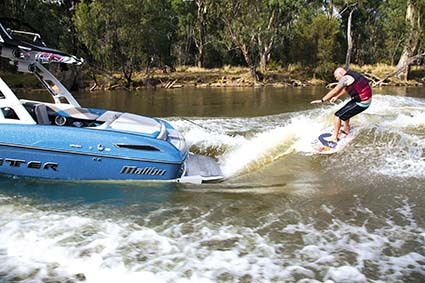 The new Malibu Wakesetter 23LSV may not make you walk on water, but it’ll surely make you float above it. 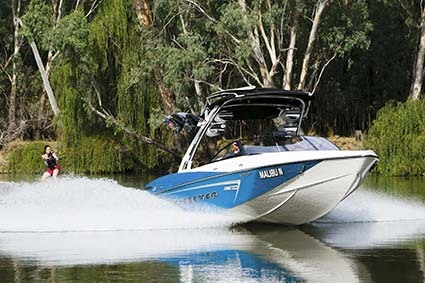 The 23LSV is one of the flagships of the Malibu range and this ever popular marine machine just got even better with the release of the Malibu 2014 model in all its finery. We joined Channel Nine and Prime TV’s Discover Downunder team at the Brett Sands Watersports Centre on the mighty Murray at Echuca/Moama. Malibu’s marketing and dealer development manager David Thorpe brought team rider Thorry Heaney to join former barefoot waterski champion Brett Sands and his youngster Bo McCallum to put on an impressive display of extreme watersports skills. We even got Discover Downunder’s star presenter and former Olympic and Commonwealth swimming champion Brooke Hanson Clarke out wakeboarding for the first time since recently giving birth. She was stoked to say the least, and on completion of the frivolity, proudly announced to her hubby Jared: "Honey, we’re buying a boat!" The overall presentation of the Wakesetter 23LSV is simply gorgeous and recent additions for 2014 have made it even more functional. Make no mistake; this is a big boat with plenty of volume rated to carry up to 15 passengers in comfort. The previous model had an enviable reputation as one of the best performing 23 footers, hence the running surface of the 2014 "Diamond Hull" is almost untouched. There is fresh styling in the remodeled deck, enhanced by thoughtful refinement of fittings, seating, layout and accessories. Some of the marked improvements include a revised dashboard, the new Wakeview adjustable seating, refinements to the Surf Gate mechanism and a full length rear preparation seat. Malibu has perfected passenger seating with the new flip up Wakeview – two pop up seat cushions that provide rear facing backrests for each side of the lounge. The mechanism is a little stiff but its super strong and won’t let you down. I have seen some other attempts at this idea that have been quite flimsy – but not Malibu’s. It allows two more sets of eyes on the riders, as well as those in the bowrider zone which now features convenient swing down armrests. The new interior architecture also provides deeper storage options, a full width preparation seating across the transom, a fully adjustable Isotta sports steering wheel and plush bolstered helm seat to thoroughly spoil the driver. Hop behind the revised dash and you’ll find yourself in the lap of luxury, enjoying its sporty demeanor. I also noted that Malibu has dropped the vented windscreen from the LSV in favour of a cool new design that complements the boat’s fresh styling. The outward appearance is simply gorgeous, in a lavish, glitzy and speedy sort of way. I really liked the metallic "Stratosphere" blue and white gelcoat combination. The fresh new graphics and colour combination is simple yet very classy and adds a real touch of prestige. Out back, the wider transom seating combines well with the optional Decadence inlay mat on the removable platform, to provide the staging area for tonnes of fun. It was terrific to finally to see the LSV in its element on smooth water with a full complement of passengers and professional riders onboard. Previously my testing has been on the big waters of Lake Hume and Port Phillip Bay, so it was hard to judge the true wake when the wind got into it. Thorry and David have this boat set up perfectly as they have been using it daily on Malibu’s Just Ride tour, where they travel the country introducing newcomers to the virtues of wakeboarding and skiing behind a Malibu. Empty the ballast, retract the Power Wedge and flip in the Surf Gate and she’s a noteworthy water skier. Flip down the Wedge, fill the ballast and she’s a sensational wake boat, and then flip out a Surf Gate for some red-hot surfing on a clean (and private!) wave with a crisp feathering lip. A simple tap on the MaliView 6.5in screen had the boat set up with Thorry’s preferred wake presets giving him a high ramp angle and steep lip for maximum trajectory. 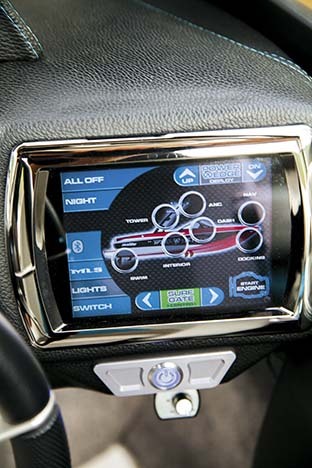 MaliView allows touch screen control of all of the operating functions of the boat including the ballast tanks, speed/cruise control and wedge angle to shape the rider’s perfect wake. The Surf Gate was really impressive on the clean Murray water and it gave me a first-hand appreciation of the shape and size of wave. The 2014 model features a faster actuator for speedy and precise control. Bo McCallum jumped on the inviting wave and blew us all away with his surfing talents. It highlighted just how good the adjustable Surf Gate really is and I’m not going to argue Malibu’s claim that it’s "the best out-of-the-box surf wave on the planet". Check out the footage on tradeaboats.com.au and on Trade-a-Boat and TrailerBoat’s Facebook pages. Our demo boat was fitted with the gutsy Indmar 6.2lt LS3 Corvette 450. You’ve got to love raw V8 power, especially this high performance engine – it rocketed us up and on the plane effortlessly even with a host of guests onboard. 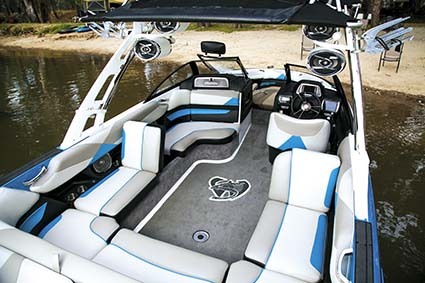 Find Malibu boats for sale.